[Jesus] is the lamb of God, sent to bring about the amnesty that had been promised. Jesus himself presented his ministry in terms of his readiness to give his life as a ransom for many--the pardon would be achieved through his death. Now the disciples must learn to accept this rejected and dying Master as the price paid for their lives. This is what it came down to when Jesus instituted the supper of his body and blood on the night before his betrayal. He had already let his disciples know, in strong statements, that he had come down from heaven so that "his flesh" might serve as food for the world (John 6:51). After the multiplication of the loaves and fishes he invites the disciples to "eat the flesh of the Son of Man and drink his blood." Only by doing so can they have life (John 6:53). These drastic formulations already pointed to the fact that it would be by dying that he would become food for humankind, and that people therefore would learn to accept and love him as the Rejected and Dying One. 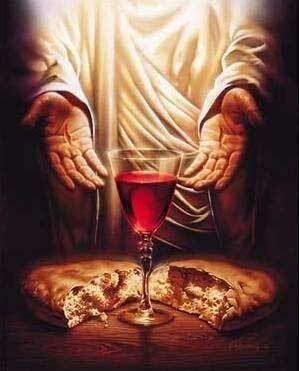 ...At the last Passover he celebrated with his disciples, Jesus distributed bread and wine as symbols of his body and blood. ...The disciples must accept this offering of Jesus' life as food for their own lives. ...The event becomes a supper of atonement with God. It is precisely by this conferring of the forgiving power of his death to the believing disciples that Jesus unequivocally distinguishes himself from every other person in history who has ever offered him or herself up for faith or nation. No hero or martyr first instituted a supper in order to distribute his death as food. At a later point, others may have gratefully remembered the suffering and death of other martyrs and profited from the consequences. But Jesus does not ask his disciples to simply think of him sometime in the future--he turns his death beforehand into the food and joyous drink meant for his own disciples. He is not the hero or the martyr who is prepared to give up his life in the interest of others. He distributes his death as a positive fact. He is not taken, nor does he allow himself to be taken; rather he gives his body and blood. His death does not create new chances for others, but his sacrifice as such is the new chance and eternal life. The disciples do not offer a toast for a good conclusion after Good Friday; rather they celebrate the meal of Good Friday. As the Exodus from Egypt, celebrated in the Passover, was a redeeming act of God, so will this exodus to the cross be the definitive redeeming act of God's Son. The Lamb of God gives himself as a ransom to the believers. It is possible to describe the bread and wine in the night of the betrayal as a sacrificial meal. Those present participate in the redemptive power of the sacrifice. Yet there is a difference. At sacrificial meals, people ate the animal that they themselves had brought and sacrificed. At the meal Jesus arranged during this last night, the focus is on a sacrifice that the participants did not bring themselves and that, at that moment, they did not want to be brought at all.